The official seal depicts Tappan Hall, with its four classrooms and ninety student chambers, surrounded by majestic elm trees  and a wheat field. Students learned in the Hall, but they also labored in the field to defray the cost of their tuition. One such Manual Labor System had been established in 1827 by Charles Finney's former pastor, Rev. George Washington Gale. Gale's new Oneida Academy along the Erie Canal prepared students for advanced theological training, but it also required them to perform manual labor. This made it affordable to more people, including Black students who were admitted there on an equal basis in 1833. In 1835, Finney arrived at Oberlin, which likewise began admitting Blacks. In the same year Oberlin also enrolled Delazon Smith. The latter might have been a mistake. Smith observed at close hand the school's vaunted academic and financial-assistance programs, and in 1837 he exposed their shortcomings in his pamphlet Oberlin Unmasked. The heading of my latest fortnightly installment of that book is Course Of Study, And Manual Labor. FICTIONAL UNINFORMED INTERLOCUTOR: Have you seen how cold it is? I'm freezing! Whatever happened to your global warming? CLIMATOLOGIST: It's still happening. World-wide averages have already risen about 1° Fahrenheit this century, and the rate is increasing. FUI: One degree? That's all? C: Even one degree affects things like sea levels and growing seasons. The real damage comes later this century if temperatures rise even faster. FUI: Phooey! There's no warming. It was ten below at my house this morning! C: And if there had been no warming, it would have been eleven below. You should be thankful. Another Yogi-ism: Nobody goes there anymore. It's too crowded. What he meant, of course, is that now that the place has become popular with the masses, nobody among his acquaintances goes there anymore. Update: The clinching game of the 2018 World Series was seen by 18 million viewers, a noticeable drop from the year before. That led Mark J. Burns to opine, I think traditional sports are dead. Nobody knows who won the World Series. Are 18,000,000 fans nobody? So even if every one of your buddies loved that new movie, that doesn't make their opinion universally unanimous. Is it going to be frigid next week where you are? Personally, I'm getting too old for winter. I've had to plan the next five days by carefully consulting the forecast. This chart from Weather Underground uses a light background for daytime and a darker background for night. The red trace predicts actual air temperatures. The purple one, accounting for wind chill, predicts feels like temperatures (FLT). These are the numbers than numb men's cheeks. Here in the Pittsburgh area, Monday will be above freezing in the afternoon, so I'll lay in some groceries. Tuesday I'll probably have to shovel a couple of inches of snow. But then I'll stay huddled inside my apartment for the next 72 hours straight, because at dawn on Wednesday the FLT will be -5° and at dawn on Thursday it will be -22°! I won't venture out again until Friday afternoon, when I'll be able to collect three days' worth of morning newspapers because the FLT will have climbed to a bearable 10° above. A local NWS meteorologist calls this the worst cold snap in a quarter century. The last time we had an outbreak like this was 1994, says Lee Hendricks. And before that, 1985. Fortunately, once we get past Groundhog Day the actual temperature is expected to moderate into the forties. 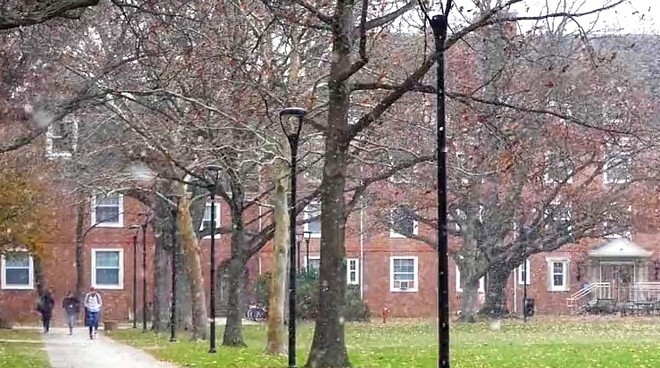 The folks above are ignoring a few snowflakes as they depart from the dormitory known as Burton Hall, on the north end of the Oberlin College campus. Presumably they're on their way to class. I know that route. 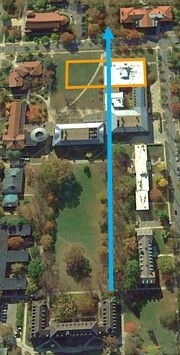 I walked it a third of a mile to breakfast each morning when I was an Oberlin freshman, 53 years ago. On the recent aerial view at the right, the blue arrow depicts the first half of my daily journey. I've outlined in orange the place where a science building once stood. It seemed to block my way, yet I magically passed right through it. Nowadays the eastern half of that building is gone, but I remember the orange-juice can in the display case. I'll tell you all about it in a short new article about Passing through Kettering. In 1893, James M. Black was a Methodist Sunday school teacher in Williamsport, Pennsylvania. One day he was taking attendance. Bessie, the daughter of a drunk, had failed to show up. Black thought to himself: if our names were called from the Book of Life in heaven and we were absent, how sad it would be! He grumbled something like, "I called the roll and she's not here, but I trust that when the roll is called up yonder, she'll be there." He searched the songbook for a hymn to that effect, but there was none. When he got home, he sat down at the piano and wrote one himself. A few years later, in a church in Kentucky, Lydia Morton (my future Grandmother Thomas) joined in the singing of "When the Roll Is Called up Yonder." She later described how the song leader stood before the congregation, holding a hymnal in one hand, conducting with the other, index finger outstretched. Usually his swinging finger pointed upward. But when he reached the final note of "I'll be there," he pointed down. Apparently, at the time of the heavenly roll call, he himself would be in the lower regions. My grandma and her friends giggled. In 1953, the Sunday services at a small Texas church always followed the same pattern. After forty minutes of preliminaries, the pastor would preach a long-winded sermon. Then there would be a prayer. The congregation would sing a psalm. Next the offering plates would be brought forward; there'd be another prayer; the plates would be passed around and returned to the altar for yet more praying. Finally, the preacher's plump wife would sit down at the piano and accompany herself as she sang an inspiring hymn. Then the preacher would recite the benediction and the service would finally be over. One Sunday, little Ernie got restless as the plates were being passed. "When is this gonna end?" he whined. "I wanna go home!" His older brother shushed him, reminding him that "Church ain't out till the fat lady sings." That struck the kinfolk as comical. People weren't supposed to mention the preacher's wife's corpulence. The story was whispered around town to much giggling. A 1976 booklet called Southern Words and Sayings actually printed the line "Church ain't out till the fat lady sings." That same year, a Texan named Ralph Carpenter, "one of the world's funniest guys," came up with a variation. He was the sports information director at Texas Tech. In the finals of the Southwest Conference basketball tournament, his team seemed to be on its way to an easy victory. However, Texas A&M came from behind to tie the score at 72-72. Bill Morgan of the SWC said, "Hey, Ralph, this is going to be a tight one after all." 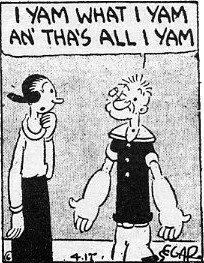 Ralph replied, "Right! The opera ain't over until the fat lady sings." Perhaps Ralph revised the saying because it didn't seem right to joke about "church" in a press box. At any rate, his comment caused an uproar among his colleagues. Two years later another Texan repeated it on national TV, and it became a proverb. The meaning, of course, is that we shouldn't assume that the outcome has already been determined just because one team is ahead. Until the game is actually finished, the losing team always has a chance to come back and win. But why the metaphor about pudgy vocalists? Some people assume that it's an actual operatic reference. 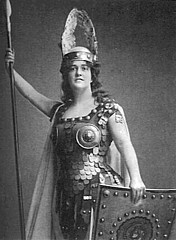 To think of fat female singers is to be reminded of Wagnerian sopranos  although these divas generally start singing well before the final act. 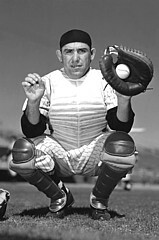 Other people assume that it must be a Yogi Berra quote, because of its similarity to his famous tautology "It ain't over until it's over." And in another, he documents the story of "the opera ain't over until the fat lady sings"  the one that I've outlined above. The year 1826 marked the death of an inspirational pastor, John Frederic Oberlin, in the small town of Waldbach (now Waldersbach) on the borders of Alsace and Lorraine. Seven years later, a new settlement was founded on what was then the American frontier. It was named Oberlin in the pastor's honor. The plan of Oberlin originated with Rev. John J. Shipherd in July of 1832, while he was pastor of the Presbyterian church in Elyria, Ohio. Associated with him in the development of this plan was Mr. Philo P. Stewart, formerly a missionary among the Cherokees in Mississippi and at that time residing in Mr. Shipherd's family. The plan involved a school open to both sexes, with various departments  Preparatory, Teachers, Collegiate and Theological  furnishing a substantial education at the lowest possible rates. This school was to be surrounded by a Christian community, united in the faith of the gospel and in self-denying efforts to build up the school. Families were to be gathered from different parts of the land to organize a community devoted to this object. Those are the words of John H. Fairchild in 1860. Some financial support in the early days came from ardent abolitionists such as Arthur Tappan, a wealthy New York City merchant. However, Fairchild admitted, The site has been matter of frequent criticism, and many are still unreconciled. One such critic was a student named Delazon Smith, who also had other, much greater objections. Some of his disagreements were with religious leader Charles Finney, a famed evangelist of the day. 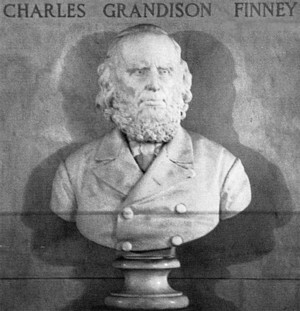 Finney later became president of the college (1851-1866) and was succeeded in that office by Fairchild. In Delazon Smith's 1837 pamphlet Oberlin Unmasked, he recalled a conversation with Finney. They happened to mention another preacher, and Finney demonstrated his Christian charity by denouncing his reverend brother as a liar, worse than the Devil himself. This fortnight's installment of Smith's pamphlet consists of his brief Introduction to what was then Oberlin's brief history. If I correctly understand the numbers from the World Data Lab, a person with an annual income of at least $40,000 is considered rich. Below that, he's middle class  unless he has to survive on less than $4,000 a year. Such a person is financially vulnerable, and a sixth of these vulnerable people are actually living in poverty. The good news is that we're gradually overcoming poverty, and half of the world's people now earn more than $4,000. 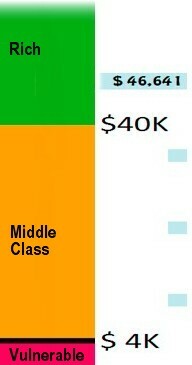 Half of us are middle class or better! In our especially fortunate nation, we assume the average American is a middle-class person. But maybe he's even better off than that. According to the Social Security Administration, the average worker earns $46,641 a year, as indicated by the blue bar next to this graph. Does that make the average worker rich? It does if he's like me: single with no dependents. (Another argument against children!) He's also rich if he has a spouse who earns at least $33,359, so the two of them can split $80 grand. Unfortunately, many of us have to share a single paycheck with multiple family members. If that average worker supports an unemployed spouse and two kids, his $46,641 needs to be divided four ways. His single-earner family of four people will each get $11,660 as their portion, which is indeed a middle-class income. 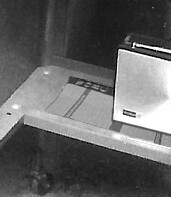 Looking through unwanted old photos that I filed away long ago, I recently found an image of the first portable radio with which I listened to my college radio station. Here it is! Or 40% of it, anyway, on the lower shelf of a roll-around table in my freshman dorm room. The bright line on the top is a telescoping FM antenna, folded down. The radio sat atop an overexposed rectangle which I've retouched to reveal its true identity as a small stack of weekly WOBC Program Guides. I retouched another part of that photo as well, giving us a drone's-eye peek into the window of my room. Those images have been added to this month's 100 Moons article. It is what it is, not what I'd prefer it to be. In awarding the 35th annual Trite Trophy last month, Gene suggested that Carolina Panthers owner David Tepper may be responsible for it is what it is. This would have been at Goldman Sachs in the mid-1980s. Item in yesterday's newspaper: CALLING IN JOBLESS CLAIM ISN'T EASY, STATE ADMITS. Ron Daly knows the drill of applying for unemployment compensation benefits. Mr. Daly said he's been trying for days to get through to the Department of Labor and Industry hot line for jobless claims, with no response but repeated busy signals. The state doesn't take jobless claims in person anymore. "Getting through on the phone has been a problem," said David Smith, a spokesman for the department. "We've had an unusually high call volume." Mr. Smith said the department was in the process of adding personnel to address the problem, which, he said, has not affected the state's Internet sign-up service. Item in yesterday's newspaper: SOCIAL SECURITY GOING ONLINE AS BOOM LOOMS IN APPLICATIONS. The Social Security Administration, bracing for the coming eligibility of 80 million baby boomers, is introducing an online application that will allow people to apply for retirement benefits in as little as 15 minutes. Commissioner Michael J. Astrue said, "We just don't have the infrastructure to handle that workload in the traditional fashion." Those are just two more examples of how robotic applications, particularly on the Internet, can provide many services better  or at least cheaper  than humans. Earlier examples include dial telephones (more efficient than human operators), voice mail (more efficient than answering services or those pink memos scribbled by receptionists), and ATMs (more efficient than human tellers). For many products, shopping online has advantages to dealing with a human salesperson in an actual store. You can still "kick the tires" online, because sometimes for books, the site lets you flip through the pages; for CDs, it lets you listen to snippets of the songs; for electronic gear, it lets you study the instruction manual. The website is more knowledgeable than the average salesperson about the products and their specifications, shows you everything that's available whether in stock or not, and even allows you to consult with previous purchasers for recommendations or criticisms. And my home library has been supplanted by Google. So has the human librarian at her reference desk. I used to keep a complete encyclopedia handy, along with a thesaurus and a dictionary of musical terms and the latest editions of World Almanac and Broadcasting Yearbook. No more. For almost all questions, online search engines lead me to the answers much faster. Inner self? Way of thinking? That isn't Biblical language. That's modern-day evangelical preaching! 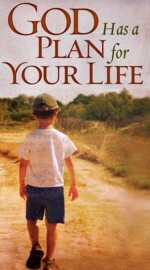 And what's this about God's purpose for your life? It may be comforting for you to imagine Almighty God up in Heaven checking his list of who's naughty and nice, thinking about you and what you've asked him for, and drawing up a detailed script for your future  you special little one, you. But the real Bible doesn't tell each of us to expect an individualized divine plan meant just for us personally. Instead, we're invited to join those who believe in God's universal Kingdom. The Bible does claim that God has a plan, but not a separate scenario for everyone. He strategizes on a much larger scale. I have a problem with that TV episode in addition to its endorsement of the rewriting of Scripture. Sheldon is teaching Missy about fractions. For example, if you have a pie sliced into eight slices (denominator) and you remove two (numerator), that amounts to one fourth. She asks if they could use a McDonald's pie instead, and he says yes. I disagree! Obviously, a rectangular pastry would be much less useful for demonstrating equal slicing. I may be turning into a bit of a Sheldon Cooper myself. 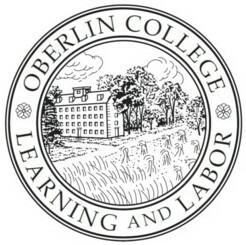 Oberlin College, my future alma mater, had been in operation for only 19 months when a new student, Delazon Smith, arrived in the summer of 1835. Delazon didn't make it to graduation. A racist scandalized by Oberlin's amalgamation (integration of blacks with whites), outraged by enthusiastic welcomes for escaping fugitives, and disgusted by the faculty's religious hypocrisy, he was expelled less than two years later. He didn't like the food, either. Smith promptly published a gossipy exposé called Oberlin Unmasked. His pamphlet is an interesting artifact of a long-gone era, including an account of how the Underground Railroad for fleeing slaves reached Oberlin in the autumn of 1836. I've found it reproduced on the Internet. However, it's quite wordy, so I've condensed it and edited it into ten manageable chapters. I'll post one on this website fortnightly  i.e., every other Thursday  through May. My mother attended the Fortnightly Club when I was growing up. These literary organizations had begun in the 19th century as a place for women to have an intellectual life even though they weren't allowed to attend college (except for Oberlin and a few others). During the winter they met every two weeks to discuss a book. The first meeting of our book club is today, as I unveil my Preface. JAN. 1, 2009 HAPPY 1959! New Year's revelry has never been the Thomas family's style. My parents and I rang in 1959 in our usual low-key way, and I still observe the event in much the same way half a century later. Back then on New Year's Eve, we stayed up late to watch Guy Lombardo and his Royal Canadians, live from New York. One year we had listened to this band on the radio, but now we had television and could see the dance floor at the Waldorf-Astoria Hotel crowded with mostly middle-aged people in funny cardboard hats, bobbing around and grinning at the camera. For them (and my father), Guy Lombardo had been a tradition for thirty years. At midnight, Guy counted down the seconds while we watched the scene in Times Square. My father called out Happy New Year! Soon afterwards, we switched off the TV and went to bed. New Year's Day began with the Tournament of Roses Parade in Pasadena, California. Because my father was a General Motors dealer, in December we had received a copy of the official program for the parade, describing all the floats in order (including the GM entries) with a designer's sketch of each. Following along in this booklet made our viewing of the parade on TV a more interactive experience, and we paid close attention. Back in 1959, the parade was followed by the bowl games. Each had a traditional early-afternoon kickoff in its respective time zone. First were the Orange Bowl on ABC, the Sugar Bowl on NBC, and the Cotton Bowl on CBS. Those would be followed by the granddaddy of them all when NBC returned to Pasadena for the Rose Bowl later in the day. Because we lived in Big Ten country, specifically Ohio State, we weren't particularly interested in the early matchups. One of them was on the TV while we performed the ritual of taking down the Christmas tree, carefully packing away all the ornaments and lights before dragging the bare tree (still trailing a little bit of tinsel) out the front door for a proper disposal. Mother vacuumed any remaining pine needles from the carpet, and the holidays were over for another year. Except, of course, for the Rose Bowl. 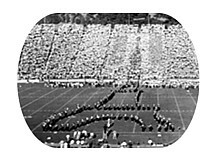 This would be the final football game of the season, as the NFL had decided its championship four days earlier with the Colts defeating the Giants in overtime in the greatest game ever played. As evening darkness fell in Ohio, we turned our attention once again to the TV where, in sunny California, the Cal band performed (right) and the Iowa Hawkeyes took the field. And we dreamed that maybe someday we'd be able to see the Rose Bowl in color.